"Developers are building at a record pace, with 9,528 units scheduled to be finished by the end of next year, Appraisal Research says. Nearly 33% of those remain unsold, a high percentage but slightly better than the first quarter's 35%." "The gap between rich and poor has widened substantially in Massachusetts over the past two decades, according to a new study by the University of Massachusetts. Only those earning the highest incomes benefited from gains in technology, productivity, and globalization, while middle-class earnings stagnated and incomes for poor families plunged 15 percent." Public Opinion Favoring a new New Deal? According to this report by Greenberg Quinlan Rosner research, the American public is restive for "bold change." One of the key findings of the report is that: "Voters are looking for dramatic action. Just 35 percent of voters say we can solve America’s problems with minor changes, while nearly two-thirds believe it will take 'major changes' to bring about solutions." And these respondents look more favorably upon the political legacy of FDR, rather than Reagan, to affect that change. This climate of political disenchantment is similar to the one that greeted FDR when he entered office. Americans had gone through 12 years of Republican administrations; they viewed Hoover as grim and ineffectual as a leader. His predecessor, President Coolidge, had a famous line that "the business of government is business" which did not exactly resonate with the masses in the fall of 1932. People were ready for boldness and a different approach to economics and government and they got it. Memo to the candidates to "make no small plans." New York's loss is Chicago's Gain? 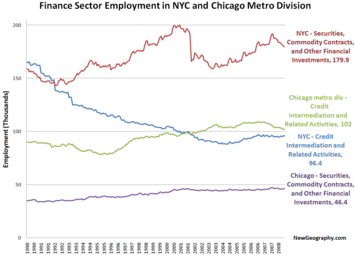 Employment in the securities and commodity industries has held steady in the Windy City, showing an unusual resilience while marquee names such as Citigroup, Merrill Lynch and Lehman Brothers hemorrhage billions of dollars in connection with subprime mortgages. Members of the Chicago trading community say the transparency and technology provided by the futures and options exchanges has insulated them from losses the International Monetary Fund estimates will total $1 trillion. Chicago Trib link via Steve Bartin. This recent article in the San Francisco Chronicle discusses how politicians in the city are trying to stem the flight of blacks from the city - who now only make up 6.5 percent of the city's population (it was 13.4 percent in 1970). There are two problems with this article. One is it fails to contextualize the pattern of black migration in America. As this report from William Frey of the Brookings Institute points out, black population growth is shifting to the South and to newer communities in the West with a lower cost of living. If you look at a map of California in Frey's report, you'll see 25 percent population growth of blacks in some suburban communities. Secondly, the article doesn't link this occurrence to current economic trends in San Francisco. The city is increasingly becoming a haven for the very wealthy which is pushing out the middle and lower earners - and blacks in the city are more likely to fall into this income bracket. Finally, albeit a small reason, Section 8 vouchers are moving some working class blacks to the suburbs. If you read the Chronicle article, it sounds like the City is being very antagonistic towards the black community. Perhaps it is in an inadvertent economic way. I think that perhaps the bigger culprit is that the city is not hospitable to the middle class and families any longer. And secondly, college-educated and affluent blacks are choosing to live in cities like Atlanta where there is a higher concentration of black professionals and business and cultural centers. With 36 Chicago Public School children murdered in the last 12 months, the Chicago Sun-Times reports that getting shot has become the number one fear of children in the city's violent neighborhoods. The fear seems most pervasive among fifth to eighth graders. Yesterday, an article appeared in the SF Chronicle by C.W. Nevius about an Internet salesman who lives in a tent in Golden Gate Park because housing costs are too high. He works by day at a cafe and pitches his tent at night getting up before dawn when the police do raids to evict illegal campers. With much of the new development in SF geared towards the flush Web 2.0 crowd, there are fewer and fewer places for the lower middle-class to live. The resident hotels in SF are not pleasant places to live or even visit (I went voter canvassing in a few three years ago). What is the housing solution for the Tom Sepas of the world? If we ever start seeing 21st Century Hoovervilles, they could be populated by people like him. A very sobering tale that shatters the popular vision of the everyman Internet worker as some high-flying urban hepcat. Yet a substantial number of these residents of big cities and inner-ring suburbs don't have their hearts in it. They would prefer to live on the suburban fringe or in small-town America, as repeatedly shown by surveys during the past decade. Bizjournals just released rankings of micropolitan areas. Micropolitan areas are urbanized small cities where the central city population is between 10,000 and 50,000. Like metropolitan areas, micropolitans are still defined by county and commuting geography, so many are larger than 50,000 overall. Because they offer self contained employment centers, these types of places may prove to be even more appealing as energy costs escalate. Recent domestic migration trends show that small and medium sized metro regions are attracting the most new residents. Check out the rankings list, it's odd to note that most of the top 20 are in northern climates. Not surprisingly, small college towns dominate the rankings, offering a source of stable professional jobs and the added vitality of a new crop of 20-somethings each year.